One of the by-products of living in a more rural area is rural electricity prices. When we received our first electricity bill, I had a bit of sticker shock since I’m not used to the higher delivery rates that come with living outside of the city. Of course, that sent me on an energy-saving track, looking for ways to reduce our bill. Discovering super bright LEDs and the GE energy consumption calculator was a great way to start my research. 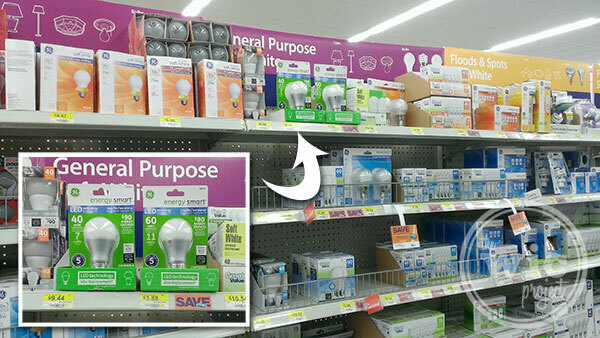 You can find the GE LED Energy Smart Light Bulbs at Walmart in the light bulb aisle. During a recent trip to Walmart, we stopped by the light bulb aisle to pick up some new bulbs. The GE LED Energy Smart light bulbs immediately caught my eye. First, I don’t recall seeing any other light bulb with a 5 year warranty. Seriously – who puts a warranty on a light bulb? Apparently GE does, because that’s how good the GE LED Energy Smart light bulbs are. The 40 watt GE LED Energy Smart light bulbs can last up to 22.8 years. Can you imagine only having to replace your light bulbs every 20 years? GE LED Energy Smart light bulbs are smaller than traditional CFLs, which means they should fit everywhere a traditional incandescent fits. The benefits of LED light bulbs don’t stop with longer bulb-life. Let’s talk money. We picked up 2 packages of the 40 watt and 60 watt bulbs. 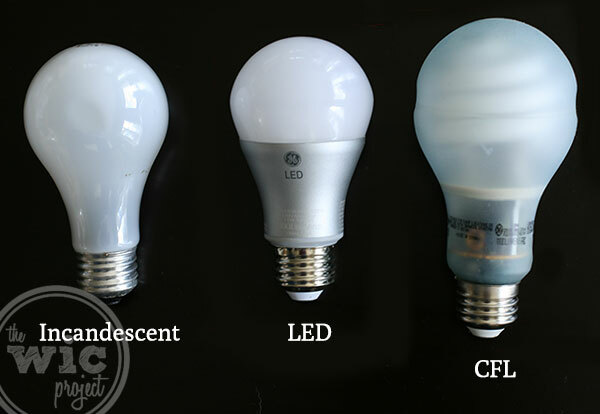 Each 40 watt bulb offers a $90 energy savings per bulb and each 60 watt bulb offers a $80 energy savings per bulb when compared to their incandescent bulb equivalents. That means that by swapping out these 4 bulbs, I’ll be savings about $340 in energy costs for the life of the bulbs. Let’s not forget that I’ll only be swapping bulbs out every 1-2 decades, so that’s even more savings since I won’t be changing bulbs as frequently. 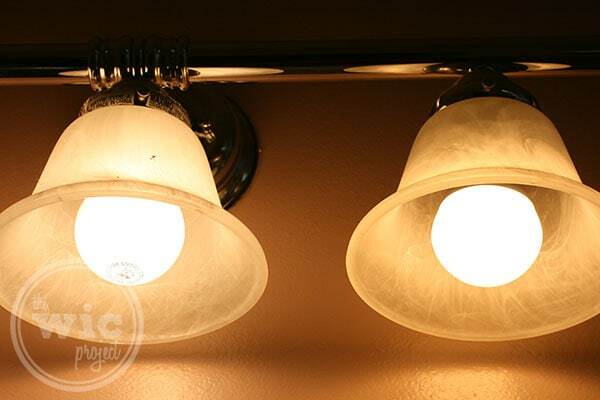 To kick off our energy savings, I replaced the bulbs in the vanity light bulb strips in the bathroom with our new GE LED Energy Smart light bulbs. Each strip has 3 bulbs and we have 2 strips (one for each sink.) 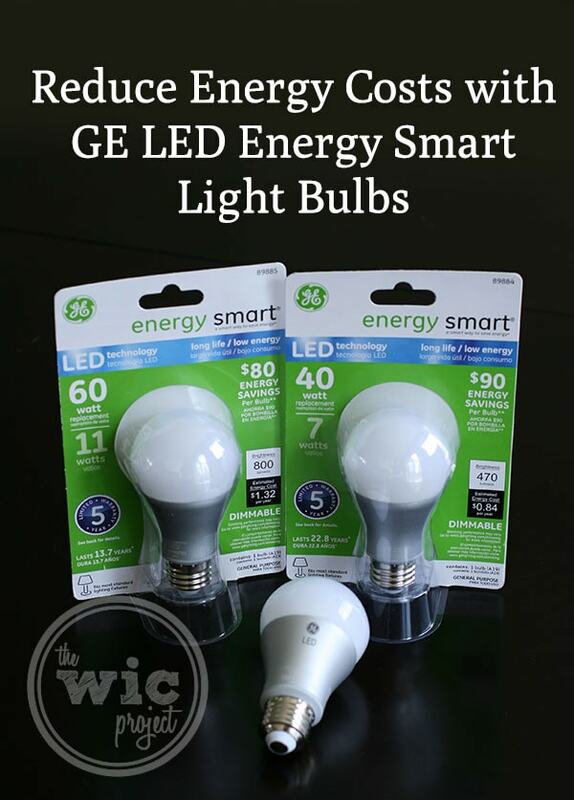 Swapping out the 75W and 100W bulbs to 60W GE LED Energy Smart light bulbs will save us $35.41 annually. I love how there’s still plenty of light – it’s just energy smart-er. Can you tell which is the incandescent bulb and which is the LED bulb? I’m really looking forward to converting the rest of our light bulbs to GE LED Energy Smart Light Bulbs. Our kitchen and dining area alone has no less than 15 flood lights, most of them incandescent bulbs. If we changed all of the bulbs to GE energy smart LED Floodlights, we would save $99.37 per year, according to the GE energy consumption calculator. That’s just in one area of the house! Swapping our your light bulbs for more energy efficient lighting options is one way we’re reducing our energy bills. We’ve implemented a few other tricks for reducing our bills as well. We have a southern-facing home with lots of windows, which means on a sunny day, it can get hot. We open our window blinds during the day to help heat the home, then close them at night to “trap” the warmer air in. By using the power of the sun, we run our heaters less. We’re on a well, which means we have a pump that is constantly pushing water to the house. 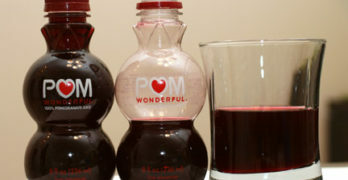 You know what that pump runs on? Electricity. That means the more water we have running, the more our water pump is running. Turning off water while brushing teeth or washing the dishes not only saves water, it saves electricity. 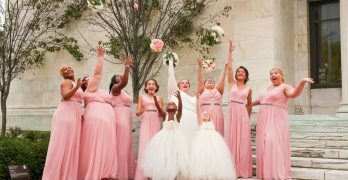 This one is a pretty easy one as well. If you’re leaving a room, just flip the switch and turn the lights off as you leave. Do you have any tips and tricks for saving energy? This was smartly written. I still think people are too quick to pass on quality bulbs because of the price and don’t see the value quite yet. Well thats great information. I had an strong belief that LED lights were more energy efficient compared to the other categories. But after reading this post,I need to rethink once more. Thanks for sharing this mate..!